Yesterday's wordless post was about the absence of the barge in the pic above. Today they towed it back to where it can resume pumping liquidfied sand through a pipe to the shore. The barge had to be moved because of high surf. Meanwhile, all the heavy equipment and spigot (bottom pic yesterday's post) sat idle. 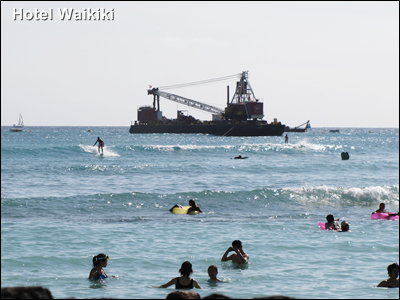 Today, we have barge, yes, but then there's another high surf expected soon and the barge has to be towed away again which only means more delay for the already behind the schedule sand replenishment project. 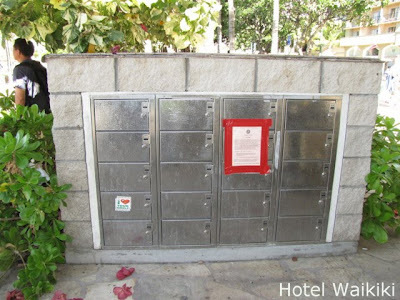 I tried in vain to rent one of these almost impossible to get beach lockers (pic taken in 2009), but the City personnel in charge of renting the lockers was never there and wouldn't return my calls even though I left my phone number in the voice message. Many renters use to sublet their lockers to a third party in exchange for a higher rent and make a profit in the process. Subleting isn't legal I believe, but that reduces the odds against original renters ever ending their leases and eliminates more vacancies. 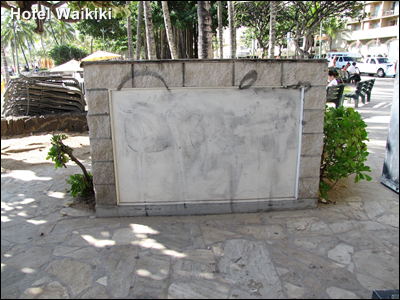 Anyways, the pic below is of the same 2009 lockers, but they're boarded up. I don't know the story behind it. There are other locker units stationed where the people play chess but I didn't go look. Cloudia- those lockers are handy if you're lying on the beach. People who live here often assume wrongly that their stuff momentarily unattended won't get targeted. Thieves have no qualms about that. And they're real quick too.